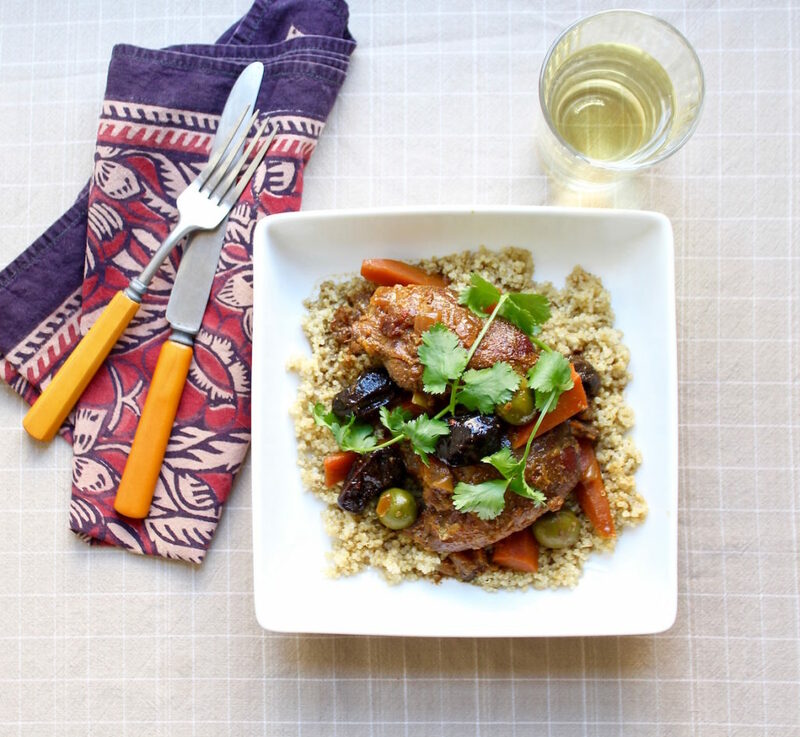 Quinoa makes a great substitute for couscous. Some years back I was gifted with one of the first Crockpot cookbooks, a used version which, by the looks of the dogeared pages, was at one time much loved. This was before I even had a slow cooker, and after awhile I sent it to the thrift store, since so many of the recipes involved opening cans of condensed soups or packs of spice mixes. The food snob in me declared this was most certainly not cooking, but rather dumping fake ingredients into a machine and waiting for the results, a mix of foods and non-foods which eventually would resemble food. We’ve come a long way from those early days of slow cookery, and now even exalted food journals like Food & Wine and Bon Appetit recognize that time-challenged cooks want to cook their own tasty meals, with real ingredients, while they are doing something else like working or playing. Or sleeping. You can find slow cooker recipes on any legitimate food website and inside many of the aforementioned magazines devoting to cooking. With winter’s chill comes a desire for fragrant stews and braises, and the slow cooker delivers a hot meal with very little fuss. Sometimes you get a better result by searing meats before adding them to the cooker, but some types of protein take on flavor without dirtying extra pots. Like the boneless, skinless chicken thighs in today’s Moroccan spiced chicken with prunes, green olives and carrots. No oil is needed since the thighs are less lean than white meat chicken and the sauce will be fragrant and full bodied from the melding of aromatics with the meat. This recipe takes well to kitchen improvisation and substitution : other dried fruits like apricots and golden raisins if you don’t care for prunes, the addition of chickpeas for a more protein laden meal, butternut squash chunks instead of carrot and any riff on spicing you desire. This dish is easy to assemble and your house will smell great while it’s cooking. As I write this, we are having a couple of 80 plus degree days in Richmond (this winter I have barely opened the coat closet), but I still love a hot meal even when the ceiling fans are doing double-time! Wherever you are cooking, I hope you find comfort and delight in this, and other (see Slow Cooker Beef and Cabbage Soup), slow cooker meals no matter the weather. In large slow cooker, layer in order : carrots, then onion, then prunes, then olives and then place chicken thighs atop vegetables and prunes. With cover closed, cook on low heat for 8 hours. Serve over hot couscous or quinoa, and garnish if desired with sprigs of cilantro. This entry was posted in gluten free, main courses, paleo friendly, winter and tagged boneless skinless chicken thighs, chicken with green olives, chicken with prunes, moroccan chicken, paleo chicken recipes, prunes, slow cooker chicken recipes, slow cooker chicken thighs on March 3, 2017 by Michele Humlan. The aroma lifts from the screen. Lovely, and surely delicious and satisfying! Thanks – now I know the visuals of the article were effective!